Mojave is a tiny town with not much to recommend it, but it does have a decent market and the Motel-6 is cheap. We all further lightened our loads by sending extra stuff ahead to the post office at Lake Isabella, which is a bus ride west of Walker Pass. A bit about my pack: The ZPacks Hauler is an outstanding ultralight packpack designed for Ultra-Light use. Meaning, the total carry weight needs to be 30 lbs with an absolute max of 40 lbs. So 45lbs, which exceeds the weight limit of the pack. 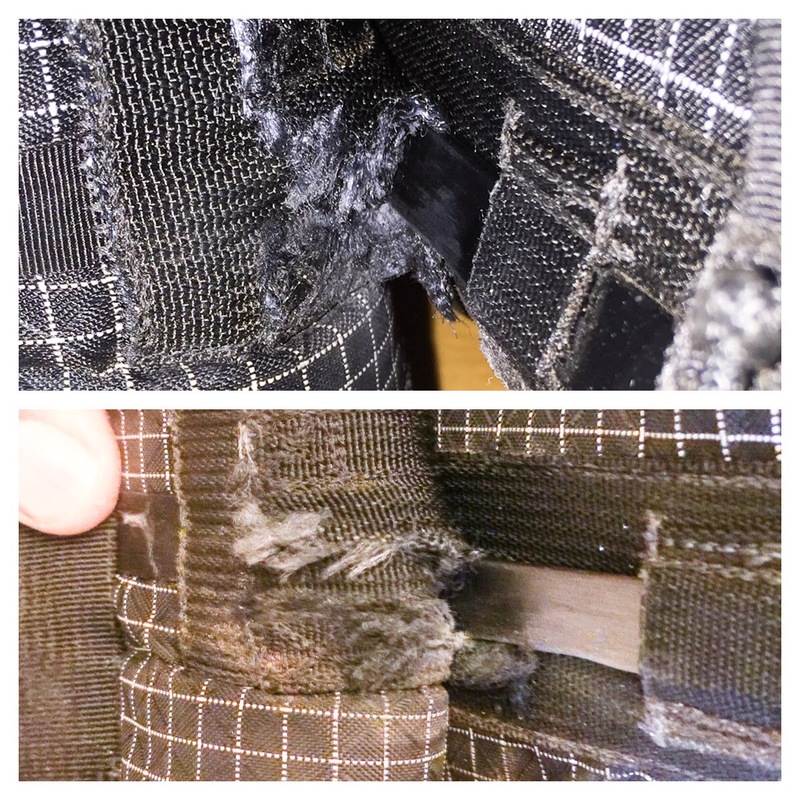 I’m stating all this to possibly explain why the @#%-ing hip belt is ripping off again. I noticed it starting to rip at the Andersons and by Mojave it’s over an inch long. And I babied the pack over the last 80 miles! The picture shows the progress of the rip. NO WAY was I going to the Sierras with a broken pack. Well hopefully this will solve your pack issue! I’m sure that would make you happy. Just to note: If you’re getting the Osprey hydro-pak with that new pack, the cap needs to be seated properly or it tends to leak. It’s an issue that kept coming up while I was doing research on packs for my own thru hike next season. Thanks for the tip. I doubt I will invest in the Hydro-Pak for this trip. I’m satisfied using bottles. P.S. If you’ve finished that last chapter of the book you mentioned in an earlier post… I can recommend “North to the Night” by Alvah Simon. Fantastic story – true too. I think you would like it.